We'd like to introduce you to a merry band of characters called the Toad Hollow Gnomes! Since ancient times, they've ruled and watched over all the forests and wild places. More recently, they've expanded their realm to include suburban backyards and flower gardens. 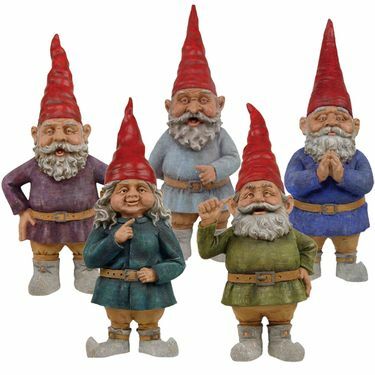 In this set of 15-inch tall cast stone garden gnome figurines there are 5 unique gnomes, each with their own colorful outfit and individual sense of style. There's Merlin, our purple magician; Zelda, the teal blue female gnome; Rumple the dark olive green garden gnome; Mordecai our peaceful praying gnome, and Grimmbel, our light blue-colored gnome. Every Toad Hollow Gnome can stand their own ground, especially since they're made from weather-resistant cast stone resin. For you rebels out there looking for a motorcycle gnome, please browse our garden gnomes page for our related biker and biker babe garden gnomes.